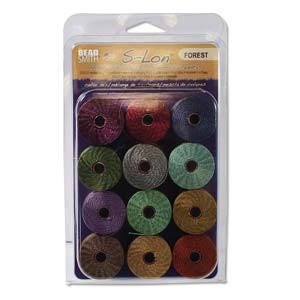 The FOREST Collection of S-Lon Beading Cord from The BeadSmith. Twelve spools of Tex-210 S-Lon (medium) beading cord for kumihimo, macrame' and more. Each spool is approximately 77 yards long. S-Lon beading cord is .5mm 3-ply twisted, bonded multi-filament nylon cord. May be used for 6, 8 and 11/o seed beads or other beads with at least a .8mm hole. Im really very happy with this product, just like in the picture, i recomend this seller 100% , it was really wel pakt and very fast shipping, tank you. This product is of excellent quality, the color is really very beautiful and the delivery was very fast !!! I received the product in a week, I am very happy and I indicate this product !! !